To some it is easy to write Japanese food off as sushi and stuff. Yet, I love Japanese food and have no need for sushi, which means I love places like Toronto. Why? Because Toronto has a diversity of Japanese food to offer, like ramen and curry. One of these places is Gyugyuya, specializing in Japanese curry. Situated right next to a popular ramen spot, it was strangely empty inside and waiting for my wife and I to eat. While Toronto is a couple borders north of the border, it is an incredibly diverse city with food from just about everywhere. One of the foods we wanted to check out was tacos, and this led us to Grand Electric. Now, going into this we knew that Grand Electric wasn’t going to be serving up traditional Mexican fare, but the menu seemed good enough that it didn’t matter. As a man who loves his burgers, I often try to find the best burger I can when I go to a new city. 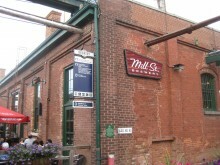 In Toronto, this meant a trip to Allen’s. Allen’s charges a hefty price for their burgers, but they come from a local farm, without hormones or antibiotics and all the other stuff that means great meat. Moreover, the butchering and grinding is done in-house, guaranteeing each burger comes from just one cow. 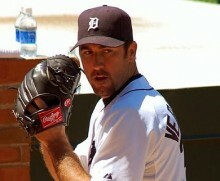 On Saturday, May 7th, Justin Verlander pitched the second no-hitter of his career. It’s a hell of an achievement and certainly one to be proud of. And sure, it’s cool that he is now one of only 30 pitchers in the history of Major League Baseball to throw multiple no-hitters, but the way he celebrated is even cooler. I like my poutine with gravy and curds. A few more beers into the night and not yet having satisfied my craving for poutine in Toronto, my drunken munchies search became a quest for poutine. 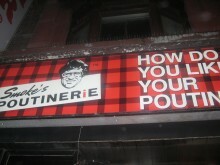 The quest ended when we discovered Smoke’s Poutinerie in the Queens West area. This place was a chain, but still had the look of a greasy hole-in-the-wall style poutine joint. Their menu had a few different variations of that delicious treat, even one including bacon, but we decided that the traditional was the way to go. We got a large for 8 loonies and waited about 30 seconds for them to toss the fries, curds and gravy into a box for eating.